These rare hyperinflation banknotes, issued for the Reserve Bank of Zimbabwe in Harare, are currently out of print and withdrawn from circulation. Please note: this is a stock image. The banknotes you receive may have different serial numbers to the banknotes pictured. All bills come secured between the solid sheets of corrugated cardboard in a padded envelope. Banknote grading terms we use UNC - Uncirculated perfect condition, never used. EF - Extremely fine, some weak folds or creases or one strong fold. Sharp edges of the bill might be slightly rounded. VF - Very fine, might have some folds, but the note should still be crisp and has a very little amount of stains. History of Hyperinflation in Zimbabwe Hyperinflation occurs whenever a countrys currency is created at too high of a rate. The history of Zimbabwes hyperinflation is a lengthy one, and it revolves around a government that slowly became derailed. Originally, the Zimbabwe dollar held high value. In fact, dating back to its origin in the 1980s, the Zimbabwe dollar held more value than the U. The early years of Zimbabwes economy saw great growth and development. Various industries and crops were thriving, and, thus, Zimbabwes economy had begun to thrive as well. However, the tables began to turn under the reign of President Robert Mugabe. In the early 1990s, Mugabe, with the help of the World Bank, decided to create an Economic Structural Adjustment Program. This ESAP would begin the gradual fall of Zimbabwes currency. As a result of this readjustment, the government forced various land redistribution and land reform. Not only would this shift in land reform contribute to the fall of the economy; many claim that Mugabes actions were racist. Mugabes government took away land from white farmers and redistributed it to black farmers as an act of correcting the injustices done by colonialism. What Mugabes government did not know is that many of these black farmers were not prepared to tend to the new land, and thus many crops and industries began to plummet. Once these various crops and industries began to fall, the rest of the domino effect began. The banking sector collapsed as soon as the farmers were not able to receive loans. The food output rate fell by almost half of its percentage, and therefore manufacturing rates also declined. Ultimately the unemployment rate rose to a startling 80%, and the life expectancy rate dropped. All of these awful consequences affected the monetary value of Zimbabwe currency for a few different reasons. The government did not honestly report their spending to the International Monetary Fund, so there was no record of the imminent doom facing the country. 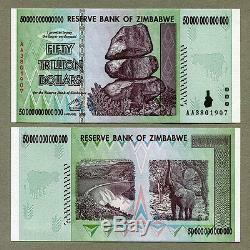 In addition to the war efforts, there were a few other causes for the eventual hyperinflation of Zimbabwe currency. Due to the corrupt government, many officials were being overpaid, and people were not confident in their governments abilities. This unfaithful feeling towards a countrys government has the tendency to undermine the faith of currency. The Timeline of Zimbabwes Currency Hyperinflation Follow this timeline for insight into the amount of time it took for Zimbabwes currency to crash. April 1980 The very first Zimbabwean dollar is created in order to replace the Rhodesian dollar. A series of Zimbabwe bank notes are issued. August 1, 2006 The government begins to attempt a currency reform in order to cease the inflation. August 1, 2008 The government now implements another attempt at currency reform by eliminating ten zeroes from every Zimbabwe dollar. The third Zimbabwe dollar is now worth 10 Billion old dollarsthe second Zimbabwe dollar. However, despite this new implementation, inflation continues to rise. February 3, 2009 The Reserve Bank of Zimbabwe takes over and introduces the fourth Zimbabwe dollar, which eliminates twelve zeros from old bills. Dollar and the South African rand. Zimbabwe currency is obsolete and no more in use. The item "Zimbabwe 50 Trillion Dollars x 50pcs AA 2008 P90 consecutive UNC currency bills" is in sale since Friday, April 27, 2018. This item is in the category "Coins & Paper Money\Paper Money\ World\Africa\Zimbabwe". The seller is "forestwaves" and is located in Vilnius. This item can be shipped worldwide.